"I’ve really enjoyed my time at Whitmore and would like to thank my teachers for all their encouragement. I cannot wait to see what the next three years have in store for me!" "My experience at Whitmore has been like living in a film with a happy ending. I hope to become a journalist who will have a real impact." "I’ve thoroughly enjoyed my time at Whitmore. It has allowed me to find a career pathway that I wish to pursue. The supportive staff have motivated and fostered my interest in football coaching." "I am thrilled to be beginning a new chapter of my life after exceeding my expectations. Studying A Levels at Whitmore has been a fantastic experience that has prepared me for university life and beyond." 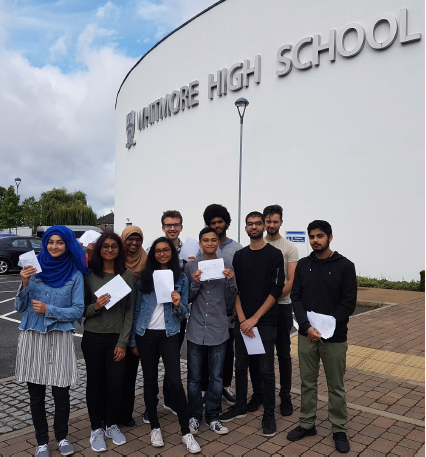 "Whitmore has supported me really well throughout my A Levels and helped me to achieve better grades than I thought would ever be possible." "I will miss Whitmore! With the help of my teachers, I have been able to aim high and achieve it. Whitmore has helped me to focus on my goals and develop my self-confidence." "My time at Whitmore has been very enjoyable and I know that my experience at Whitmore will help me to make smart decisions in the coming years." "I honestly cannot thank Whitmore enough, its staff and its students for making me the person that I am. School is not just about studying but also becoming a well-rounded person who is ready for the world. I can’t wait to go to university, meet new people and continue to develop my understanding of Physics and the world around me." "I am thankful to have had the opportunity to study at Whitmore. It has opened the door to the career I have always wanted and I look forward to the university experience and all that it entails." "Whitmore and its teachers have gone above and beyond to help me succeed. Even if my questions have not been directly related to the course, they have taken the time to help me and further develop my understanding. Although the future is unknown, what I have learned from Whitmore is that it all works out in the end!" "My 7 years at Whitmore have been, and will continue to be, the best of my life. My experiences here have shaped me as a person and I will be forever grateful to the school and its staff for helping me to reach my full potential."